I have a new article out in the Journal of Gaming and Virtual Worlds. Death of an avatar: Implications of presence for learners and educators in virtual worlds is an ethnography that draws upon work I have carried out over several years in both Second Life and Teen Second Life. The paper includes several first-person vignettes setting out some of my most memorable experiences of death and mourning in virtual worlds. They include this one from September 2007, the event which inspired this research. It’s late on a warm summer’s evening. I am sitting in a Japanese-style summerhouse with a group of friends and colleagues, mourning the unexpected death of a member of staff. ‘She was like a mother to us’, reads an artwork created by a group of teenagers earlier in the day. For a while, no one speaks or moves. I stare out to sea, where the moon is rising, casting an eerie glow over the trees nearby – but my thoughts are elsewhere. My neighbour, dressed in black, hands me a lighted candle; soon each of the group has one, and we begin talking softly of our memories and our feelings. The mood of the discussion becomes intense and dark; a couple of the teenagers and I opt out and head for the beach, where we sit long into the night beside a campfire discussing religion, reincarnation and personal beliefs. Ferguson, Rebecca (2012). Death of an avatar: implications of presence for learners and educators in virtual worlds. Journal of Gaming & Virtual Worlds, 4(2), 137-152. Virtual worlds such as Second Life® offer learners and educators environments in which they can engage in activities that would be too difficult, dangerous or impossible in the physical world. Increasingly, these settings provide learners with a sense of presence – an impression that their mediated presence is not mediated. Presence includes realistic representations, sophisticated social interaction and immersive experiences. What are the implications for learners when death is introduced into an immersive, but apparently safe and protected, educational environment? To answer this question, this article draws on a virtual ethnographic study carried out over four years in Second Life and Teen Second Life. 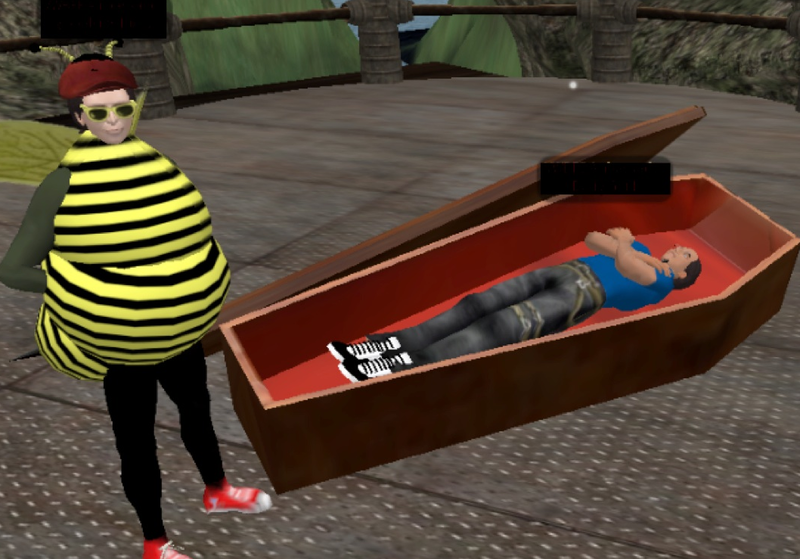 It finds that there are different types of death within Second Life, some permanent and some transient, some wholly virtual, others reflecting a situation in the physical world. Analysis of the theme of death in different settings and subject categories shows that learners and educators make use of some of these types of death to help with exploration of subjects as diverse as Roman history, military training and classic literature. In order to make use of these types of death, educators vary levels of realism, immersion and social interaction, thus altering the levels of presence available within an environment. Other types of Second Life death are not typically explored in educational settings but nevertheless raise a series of legal, social and ethical issues that will need to be addressed by future curricula. This entry was posted on September 23, 2012, 9:15 pm and is filed under Articles, Second Life. You can follow any responses to this entry through RSS 2.0. You can leave a response, or trackback from your own site.